Rock & Roll Hall of Famers Green Day donated their first ever tour bus to Car Donation Foundation d/b/a Wheels For Wishes, benefiting Make-A-Wish. The bus, affectionately known to Green Day fans as the bookmobile, took the band on its first year of touring. Now the bus will be on its way towards helping bay area kids! The bus is an old bookmobile that drummer Tre Cool’s dad decked out to be a tour bus. It was used on their first year of touring around the country. According to a 2009 Rolling Stone interview with Tre, the bus made for a bumpy ride but it was still awesome. Green Day toured the country in ’93 and ’94 performing songs from one of their most popular and successful albums, Dookie. This album, their major label debut, helped the band’s popularity soar and has sold more than 20 million copies to date. 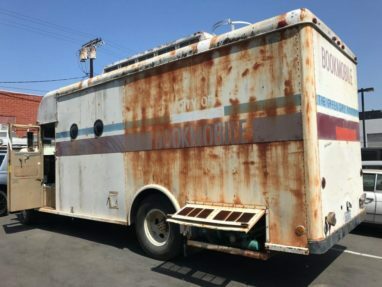 The bookmobile tour bus was how Green Day traveled to festivals like Lollapalooza and Woodstock ’94. For some people, Woodstock ’94 is most remembered for the infamous mud fight between Green Day and the crowd that resulted in bassist Mike Dirnt injuring his arm and breaking two teeth when a security guard mistook him for a fan and tackled him into stage equipment. Although the bookmobile has long since been retired as a tour bus, its legacy will live on. Now that Wheels For Wishes has received this donation, it will be restored by West Coast Customs. Later on, the bookmobile will go on display at the Rock & Roll Hall of Fame in Cleveland. On top of that, it will be auctioned off and the proceeds from this donation will also go on to help Make-A-Wish. You can help your local Make-A-Wish grant more wishes too! All you need to do is donate a car, boat, RV, motorcycle or other vehicle to Wheels For Wishes, benefiting your local chapter of Make-A-Wish. Wheels For Wishes benefits Make-A-Wish chapters around the country. Find your local chapter here to get started! If you have a car to donate, give Wheels For Wishes a call at 1-877-431-9474 or fill out an online car donation form. Our donation representatives are here to help with any questions you may have about donating a car to charity. No matter your car’s age or condition, we can accept it in most cases. Let your old car go on to do bigger and better things by donating it to Wheels For Wishes today!